On Saturday, Dec. 2, the Florida Department of Transportation plans to to shift traffic onto temporary pavement at the Interstate 95 northbound ramp to A1A/State Road 200 at exit 373. The date could be modified, depending on the weather. The shift is part of the reconstruction and widening of two miles of A1A from west of I-95 to west of Still Quarters Road. The project includes widening of ramps at Interstate 95/A1A exit 373. That exit leads to Yulee, Callahan, Amelia Island and Fernandina Beach. The $40 million widening project will increase the roadway from four lanes to six lanes and includes raised medians, bicycle lanes, curbs and gutters, sidewalks and high mast lighting. FDOT says a DDI is a type of interchange where the two directions of traffic below I-95 briefly drive on the opposite side of the road. FDOT believes the DDI will improve safety since long left turns crossing traffic lanes to enter or exit the Interstate will be eliminated. FDOT says the DDI is also more efficient because it will have only two clearance intervals – which is the time it takes for traffic signals to change from green to yellow to red. 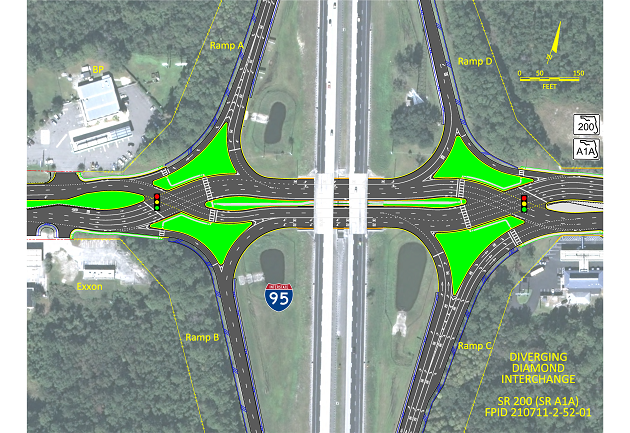 Most interchange designs have six or more clearance intervals, according to FDOT.